Nashville is growing fast, so finding a pet friendly, luxury 1 bedroom apartment can be a challenge. The Melrose Apartments put you in the middle of Nashville luxury at an affordable price. Located only minutes from downtown and some of the city's most popular restaurants, the Uptown apartment is a real steal. 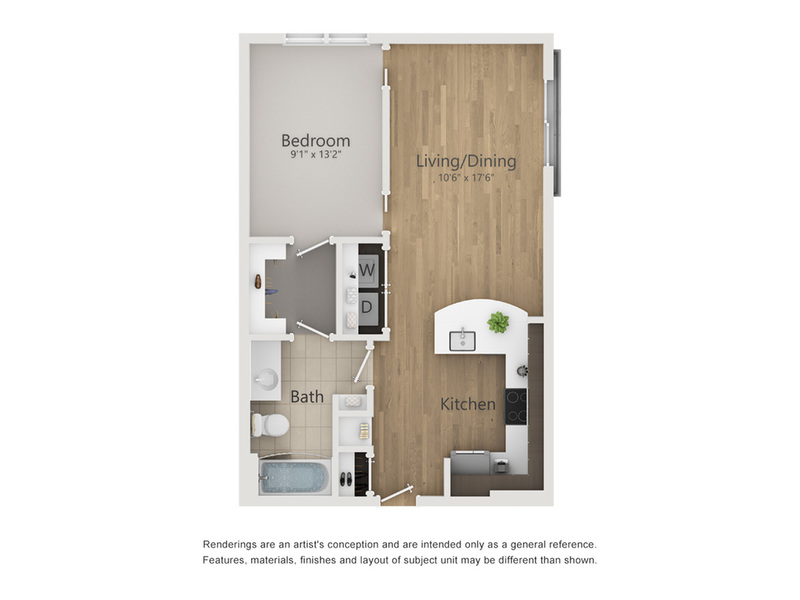 The Uptown 1 bedroom apartment has a structured 618 sq ft floor plan with beautiful stained concrete flooring, granite counter tops and a great view of Nashville. At The Melrose, we love pets, so we've made each apartment pet friendly for up to two cats or dogs. The layout includes a full kitchen, living room, bedroom, closet and bathroom. With washer and dryer included, the Uptown is a one of a kind luxury 1 bedroom apartment for Nashville. Located in the center of Nashville's Berry Hill neighborhood, you have quick access to some of the hottest haunts in town. With some of town's favorite spots like Frothy Monkey and Edley's Bar-B-Que nearby, you're never far from something to do. The Melrose is also close to the airport, Vanderbilt, downtown and easy access to I-65 and 440 Parkway. Call us today to learn more about our Uptown 1 bedroom luxury apartment. Call The Melrose at (615) 696-7448 or email us to reserve your spot in an Uptown studio apartment. We're open Monday through Friday 9:00 am to 6:00 pm, Saturday from 10:00 am to 5:00 pm and Sunday from 11:00 am to 5:00 pm.